When Austria-Hungary declared war against Serbia on 28th July 1914 her armed forces followed a pattern set by the 1867 constitution. There were three autonomous organisations, the first and most important being the Common Army, which covered the whole of the Empire. The second was the Landwehr, providing a separate ‘second-line’ army that was theoretically intended solely for home defence in the German-speaking regions, although by 1914 this distinction no longer applied. The third element of the armed forces was the Honved (Magyar király Honvédség), which was much the same as the Landwehr but for the Hungarian part of the Empire. The Honved consisted of only infantry and cavalry, but when war broke out they took their place with the rest of the forces on the Eastern and later Italian fronts. When first we look at either the box artwork or the figures, the eye is drawn to the very unusual tunics with the braiding on the chest, broad woolly collars and the trim round all the seams. This is the pelz ('pelisse' in English), and it immediately identifies these men as hussars, of which there were 10 regiments in the Honved in 1914, making up the whole of the cavalry arm. However it is also very apparent that these men are not for 1914 as most have a steel helmet, which looks to be the German-inspired M17 rather than the home-grown 'Berndorfer'. Their identification as hussars is confirmed by the cap a few wear, which is the standard field cap but with no peak, in the cavalry style. Of course having half the men riding horses also tends to be a giveaway, but the dismounted men wear exactly the same gear, so are simply cavalrymen on foot. The steel helmet is not the only indicator of late war dating; all the privates wear puttees, which became more popular than hussar boots as the war dragged on. In addition no one wears tight breeches with braiding, a traditional Hungarian feature that quickly disappeared in the horror of 20th century warfare, and there are none of the traditional field signs, another old habit that died quickly soon after 1914. Given the rush to utilitarian uniforms during the period, you might wonder how these men retained their fancy pelisse, and well might you wonder, because they didn't! The pelisse was a parade-only garment well before the War broke out, and while the rest of the army had succumbed to modernity with practical grey uniforms in 1907, the reactionary cavalry had prevailed on the authorities to retain their superb colourful uniforms. That all changed very quickly when war began, and by the time anyone was receiving a steel helmet the pelisse was a distant memory. There seems to be no evidence for anyone wearing the pelisse in action by 1917, so unfortunately these figures wear a fantasy uniform. Some pike-grey field tunics certainly had the large woollen collar, but no one ever looked like these men in combat at any time in history. The reality is, dull as it may be, the Honved looked like the rest of the Habsburg Army by 1917. Moving on to the kit, we were pleased to see more correct details for the late war dating. All the horses have the sabre on the saddle, not hitched to the man as was the case early in the war, so naturally the foot figures have none at all. Another correct feature is the bayonet, which both mounted and foot men carry, and the standard rifle ammunition pouches on the waist belt are properly done too. All the dismounted men have the bread bag (which contained the water bottle amongst other things), but none of the mounted men do. The only surprise is that the prone man with the machine gun has no sidearm. The set includes two officer poses, and both are properly done. Each wears the standard field cap of the army and has a pistol holster and a case for binoculars. Both also have the leather gaiters with spiral straps very popular with officers, and the only difference is that the mounted man wears a double-breasted tunic with large collar, and his foot comrade wears a full-length greatcoat. Since both these items have none of the fur trim or braiding (despite what the box artwork suggests), these are actually the only two accurate garments in the set, and make both figures very useful. The poses are, shall we say, traditional, either pointing to the right or firing a pistol to the right, so nothing out of the ordinary, but reasonable. The poses of the rest of the horsed men are fairly standard, and nothing to really complain about. The men drawing his sabre would have had few enough moments when this would be necessary, and the man firing from the saddle is also not going to be a common sight, but true cavalry had more of a role to play on the Eastern front than in Flanders, so nothing here is unusable. The foot figures are equally reasonable, and nicely done. We particularly liked the crouching man pulling back the bolt on his rifle, so the only pity is there are not more poses here. As you would expect the main weapon is the rifle, which all bar the officers carry, and it looks like a good model of the usual M95 Mannlicher. 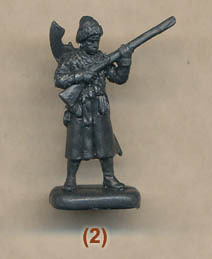 The total length is 17mm, which at about 122cm is perfect for the weapon, although a shorter version used by cavalry (100 cm in length) would have been better in this case. Apart from sabres the only other weapon is the machine gun in the second row, which is the common Schwarzlose M07/12, with no shield in this case and the tripod adjusted to lie flat. As this is a one-piece figure there are limits to the level of detail, but within those limits this too is a good model. Lastly there are the horses, which we have seen before in Strelets' Great War sets such as their German Hussars. The poses are a varied lot, with some being much less natural than others, but most have the look of animals at full speed, which fits ill with most of the human poses, and would be fairly uncommon anyway. As older models they have some of the chunky quality of many Strelets sets, and are not the most elegant of representations for this magnificent animal, but surprisingly the saddle and other equipment looks good for these men as it did for the Germans. Unlike the horses the men are beautifully sculpted. The proportions are excellent with even small detail like buttons being perfectly picked out. This set is clearly one of the new breed of high-quality sculpting Strelets is now producing, and the figures look fantastic as a result. Perhaps the poses do not have a lot of action about them, but they are lovely pieces of plastic. Only the prone machine-gunner spoils the party, as being done in one piece means there are many areas the mould could not reach, so a lot of extra plastic in place of detail such as faces and hands. However everywhere else there is no flash or excess plastic, so nice and clean mouldings showing off the sculpting to best effect. This is a set of huge contrasts when it comes to an overview, and to giving some sort of a score. Accuracy is easy - there is little here. While many elements are fine the full dress tunics are very hard to remedy and too obvious to ignore, so they massively impact the general look. The horses and officers present no such problems, but having the bulk of the men virtually useless hits our first score hard, so we settled on a score of four, though some will argue that the errors make the figures unusable and so should score zero! Pose quality is good if unremarkable for the men, but nothing too terrible, so a nine there. However the horses again let the side down, dropping the average to an eight. Pose number suffers because there are only a few of each type here (mounted and dismounted), which some will find frustrating, so the 13 poses get a score of eight as a result - again a compromise for a half-cavalry half-infantry collection. The men are all perfectly sculpted apart from the machine gunner, who to be honest is a mess at the front end, so for sculpting alone the set would have got a perfect 10. The machine gunner spoils that, and the horses drag the average down further, so an overall score of eight does not do justice to the best of the sculpting, but reflects the inconsistency here. Finally the mould, which again for most of the men would be an easy 10 as they are perfect. Unfortunately our friend with the machine gun again wrecks such a lovely score with a lot of unwanted plastic that will be a nightmare to carve away, and the horses have some flash on them too, so almost entirely because of the machine gunner we gave a perhaps slightly cruel eight. That gives us a range of scores which we are happy with, but really completely fail to tell the story of this set. Scores are always a crude way to assess anything complex like this, but never more so than with this set. Accuracy is a real problem for which there is no escape here, but the figure sculpting is excellent in places and mould quality too is excellent (in places). A pity to see some great work spoilt by some poor errors.